Thank you all for the productive discussions, creative input and fun evenings during our Workshop and MC Meeting in Barcelona. The deadline for the reservation of theses hotels is the 22nd of September and you should mention the workshop "e-MINDS COST Action" to get the discount. We recommend the aforementioned hotels because they are located in Sant Cugat, a village close to the workshop venue and well communicated by train “Ferrocarrils de la Generalitat (FGC)”. However, if you prefer to book a hotel in Barcelona, we would advise you to book a hotel close to a FGC train stop (for instance: Plaça Catalunya, Provença, Gràcia, Muntaner or Sarrià). 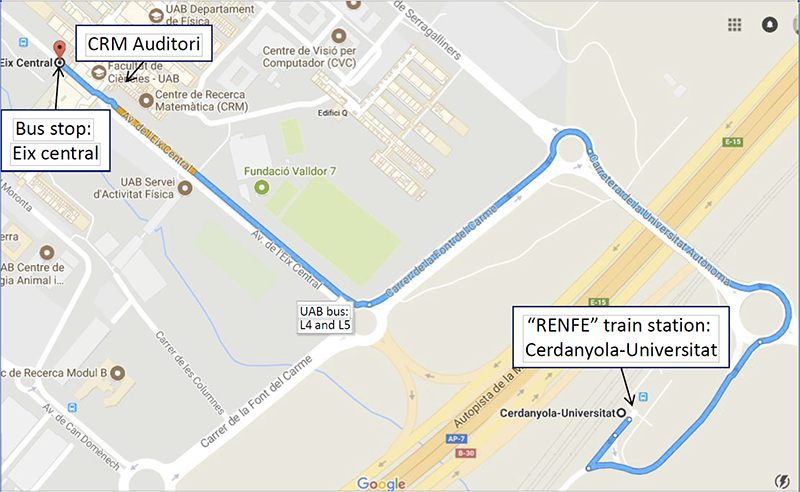 The best way to reach the UAB campus is by train "Ferrocarrils de la Generalitat (FGC)". For this, you should use the lines S2 or S6 (trains every 5 to 10 minutes) and get off at the "Universitat Autònoma" train station (see attached "FGC timetable"). Then, you should follow the blue dotted line as indicated below on the UAB campus map. You can also reach the UAB campus by train "RENFE". For this, you should use the line R7 and get off at the "Cerdanyola-Universitat" train station (see attached "RENFE R7 timetable" and "RENFE map"). Afterwards, you should get a UAB bus, lines L4 or L5, and get off at the "Eix central" bus stop (see attached "UAB bus timetable"). 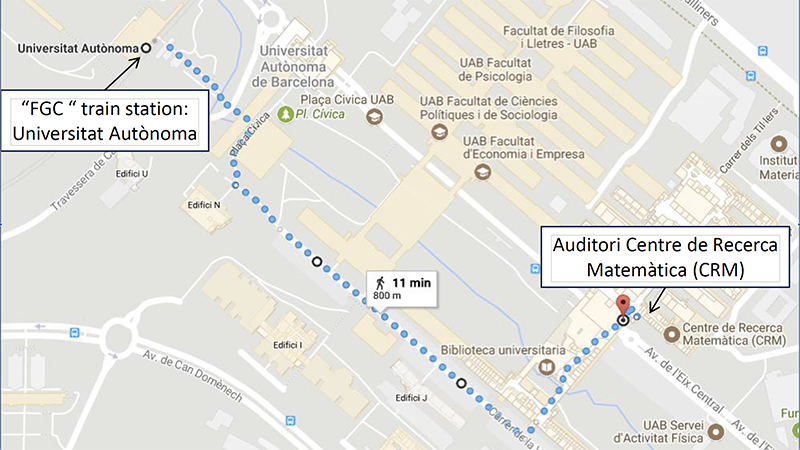 See below a map showing the way of the UAB bus from "Cerdanyola-Universitat" train station to "Eix central" bus stop and the location of the CRM Auditori. The best way to get the hotels in Sant Cugat by public transport is to go to Plaça de Catalunya in Barcelona by bus (Aerobus). Afterwards, you should get the train “Ferrocarrils de la Generalitat (FGC)”, lines S2 or S55, from Plaça de Catalunya to Sant Cugat. Take into account that the FGC train stop for the Holiday Inn Express Barcelona – Sant Cugat hotel is “Sant Joan” and the FGC train stop for the H2 Sant Cugat hotel is “Volpelleres”. Barcelona (El Prat) airport – Sant Cugat: 50 euros approximately.